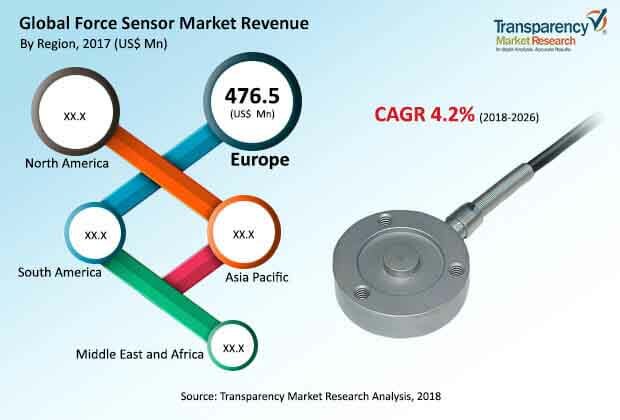 According to a new report published by Transparency Market Research, the global force sensor market is projected to reach US$ 2,099.7 Mn by 2026, expanding at a CAGR of 4.2% from 2018 to 2026.The global market is expected to be influenced by a range of macroeconomic and industry-specific factors during the forecast period. Demand for force sensors is likely to be significant in Asia Pacific from 2018 to 2026.The market in the region is anticipated to expand at a CAGR of 4.9% during the forecast period. Force sensors are hidden supporters in medical devices as they play a key role in many critical applications, most notably infusion pumps. The demand for force sensor depends on the growth of medical devices such as infusion pumps. Growth of infusion pumps will be driven by increasing occurrence of chronic diseases, geriatric population, and rising surgical procedures. Rising demand for infusion pumps and surgical instruments will drive the demand for load cells and this is expected to propel demand for force sensors during the forecast period. The global force sensor market has been segmented based on measurement type, end-use industry, and region. In terms of measurement type, the global market has been classified into tension force sensor, compression force sensor, and both. The tension and compression force sensor segments are projected to account for the largest market share during the forecast period. In these sensors, transducers are used to measure tension and compression forces. For application with limited space or to measure small forces they are used in miniature design. These are mainly three types - load cells with internal or external threads, S-type force sensors, and flat sized force transducers. Typical applications for these sensor types are for material testing machines, rope or elastic force measurement, etc. The tension and compression force sensor segment is driven by increase in adoption of sensors in medical, and material test­ing fields. Based on end-user industry, the global force sensor market has been categorized into oil & gas, automotive, medical, industrial, and aerospace & defense. Medical and automotive is the most important end user industry for force sensors followed by machinery, and pharmaceutical & biotech industries. Investments will continue in all these industries, but TMR expects to see especially strong investments in the automotive sector during the forecast period. Europe dominated the global force sensor market in 2017, with Germany accounting for majority share of 24.07%. The region’s dominance of the global market is attributed to large automobile companies, increase in industrialization and urbanization, and growth in the utilities sector. In terms of country, India is projected to lead the force sensor market in Asia Pacific during the forecast period. This is primarily due to changing infrastructure and healthcare guidelines with respect to industrial safety. India is the most attractive market for investment at present. Countries such as China, Japan, and Australia are also expected to be significant markets for force sensors. The force sensor market in India is likely to expand at a CAGR of 5.8% from 2018 to 2026. North America and Europe accounted for combined market share of 58.4% in 2017. The research study includes profiles of leading companies operating in the global force sensor market. Market players have been profiled in terms of attributes such as company overview, financial overview, business strategies, and recent developments. Key players in the global market include Flintec Group AB, Dytran Instruments, Inc., HITEC Sensor Developments, Inc., Kistler Group, Honeywell International Inc.., Futek Advanced Sensor Technologies, TE Connectivity, Tekscan, Inc., Sherborne Sensors Inc, Lorenz Messtechnik GmbH, and ME-Meßsysteme GmbH. Companies are focusing on expanding business through strategic acquisitions and partnerships with several end-use industries.